An historic round of football in Scotland saw two unexpected but refreshing results as both of the “new kids on the block” – the West Lothian Eagles and Tyne Tees Tigers – enjoyed tremendous debut victories in their new leagues. It sees a large broom sweep through the SARFL competition as the previous status quo of the league is under threat – in a very positive way for football. The fact that the two new teams defeated last year’s grand finalists in their respective games cannot be underestimated. The West Lothian Eagles are in a holding pattern for 2018. Their games this year do not count for premiership points – being development games for their entry in 2019 if all goes to plan on and off the field. Well, they have answered many questions already. To down last season’s runners-up in their opening match speaks volumes about their list of players and their off-field organisation to date. Their challenge now – with their debut win behind them – is to maintain the rage and keep performing. The Eagles started well to lead 31-24 at the first break. The Roos hit back hard in the second quarter as the Eagles dropped their intensity and, briefly, their heads. He Roos took a 14-point lead to the big break. Roos 61 led Eagles 47. After half time, however, the eagles showed the spirit around which success can be built. They lifted enormously and dominated the third quarter with a five-goal turnaround – three-quarter time scores saw the Eagles 85 to Roos 70. The last quarter was tight, but the Eagles simply would not let go to their lead and went on to win by 20 points. 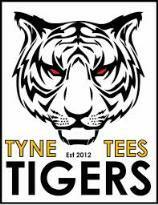 The Tyne Tees Tigers welcomed the Greater Glasgow Giants to Newcastle for their historic first home game in the SARFL. It was a celebration off the field, but on the field, the team joined in the party, completely outclassing their opposition. They dominated last year’s Scottish premiers in all facets of the game. The Giants put up a better final quarter, but by then the damage had been done as the Tigers romped to a huge 79-point win. Any fears about whether the Tigers would struggle with their move to Scotland and away from the AFLCNE were allayed as the club recorded one of the finest victories in the club’s history. The Giants were stung by a loss on the road and will bounce back, but they certainly learned the hard way that there is a new team in town. Next weekend’s Round 3 match will see the clash of tradition rivals as the Edinburgh Bloods host the Glasgow Sharks – both first round winners and determined to build on that.